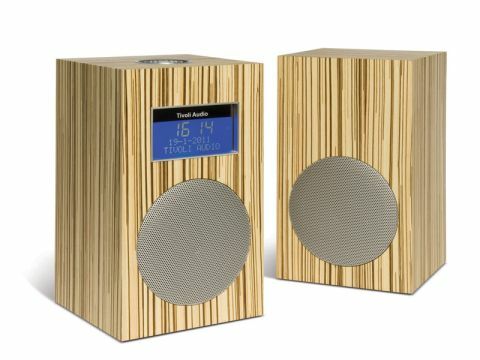 Tivoli, you may recall, made a big splash by pretty much re-inventing the high-quality table radio about a decade ago. Its Model One combined high-quality RF engineering in its FM tuner section, with an unusually decent speaker to make sounds that rivals would aspire to live up to and even try to replicate. Now, the new Model 10+ aims to do something similar for DAB. The + in the name actually refers to DAB as in the USA and in some other territories they don't have DAB: FM and AM reception are common to all versions of the Model 10. The Model One was all-analogue, but this one is mostly digital – digital tuning, digital user interface. The critical FM and AM signal path is still analogue, though, to preserve Tivoli's reputation for quality and the auxiliary input at the rear of the unit is analogue too; you can connect an iPod with a normal audio cable but there's no dock as such. Digital operation has brought the added function of RDS and also the convenience of a credit-card sized remote control. Operation is effected via a push-and-twist control on the top of the unit. Its default mode is as a volume control, but with a single brief push it becomes a tuning control and after a double push, it selects between sources. One gets used to this quickly enough, though it's not the most obvious thing at first. The remote control adds easy access to a menu with various functions including basic tone controls, stereo/mono switching and a setting we found most useful, which adjusts the way the tuner scans when auto-tuning on FM. It can be set up to stop only at strong stations, which saves a lot of time in a more urban location, where most tuners would stop for lots of almost unlistenable stations. We loved the Model One and are delighted to report that the Model 10+ is very much in the same mould, with sound that has delightful clarity and naturalness, on both speech and music. The Tivoli hallmark of well-above-average FM reception is certainly present and indeed, if one listens on headphones the FM sound is comparable with that of a decent hi-fi tuner. The sound from the speaker(s) is a fine example of what can be achieved from small enclosures on a tight budget. As you'd expect, deep bass is mostly notable by its absence, but upper bass is well handled and after the first few seconds one doesn't really miss the lower stuff. This works particularly well with speech, of course – all the better because the critical band where bass merges into midrange is handled very well indeed, nicely even and non-resonant. Music also benefits from this, no less than from the open and detailed treble, which retains most of its quality a surprising way off the axis of the speakers. As a result, any style of music plays with real conviction and a degree of realism that defies one's expectations of such a product, equally convincing in energetic, smoochy or intellectual moods. Maximum loudness is limited, but the clarity makes the sound satisfying at a modest level and, unlike some less accomplished radios, the Model 10+ doesn't make one want to keep turning the level up in a (usually fruitless) search for some kind of satisfaction. DAB sounds decent, FM very impressive, even AM is not half bad. 10 out of 10+!